Image recognition allows computers to recognize images in a similar way to humans. In the past developers had to use complex image recognition techniques and algorithms such as pattern recognition. With the release of the Cloud Vision API by Google, developers now have a powerful suite of tools available from a company with some of the best image recognition functionality available. In this tutorial you’ll build an Ionic app that allows users to take a picture recognizable by the Cloud Vision API. Using the API involves uploading a JSON file containing the type of image detection wanted and the base64 encoding of the image to the API endpoint. In this example, you have to replace base64-encoded-image with the actual base64 encoded string representation of the image. The features property is where you supply an array of objects containing the type of image detection that you want. LABEL_DETECTION attempts to classify the image by giving it a label or description. Since you specified LABEL_DETECTION for the feature and maxResults to 1, you get a single object in the responses array. In this case, labelAnnotations. FACE_DETECTION: Detects human faces in a photo, returning coordinates which you could use to draw around the detected faces. 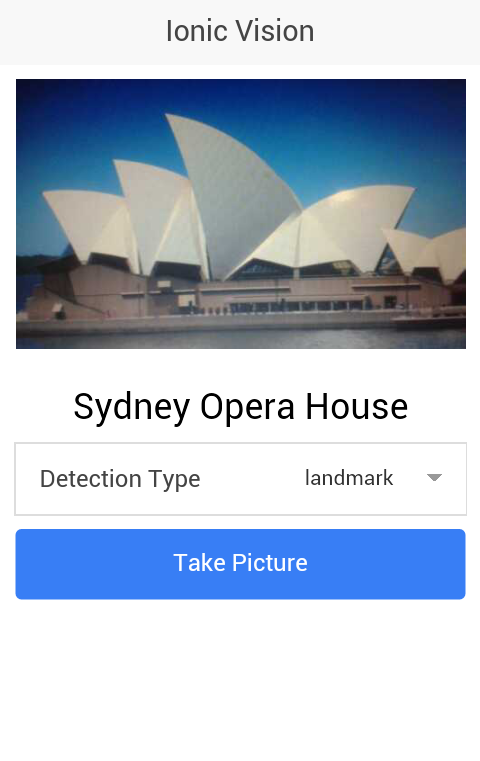 LANDMARK_DETECTION: Detects landmarks such as the Opera House in Sydney or Stonehenge in Wiltshire. LOGO_DETECTION: Detects different company logos. TEXT_DETECTION: Employs Optical Character Recognition (OCR) technology to extract text from images. SAFE_SEARCH_DETECTION: Classifies an image based on safe-search parameters. This classifies the image as adult, spoof, medical, or violence. At time of writing, the Google Cloud Vision API is in beta, which means that it’s free to try. Go to the Google Cloud Platform website and click the try for free button. This will take you to a page asking for your business and credit information, but don’t worry, Google won’t charge you anything up to $300. Once complete, create a new project on Google console, enable billing for your project, and enable the Cloud Vision API. I recommend you skip the normal process and use the ‘API Key’ option. Now you’re ready to build the app. But first I’d like to give a brief overview of the app you’re going to build. The app will have one page which contains all the elements needed to interact with the Cloud Vision API. It will have a dropdown for selecting what type of image detection the user wants, a button for taking a picture, an image element for displaying the picture taken, and a heading element for displaying the description of the picture. You can find the final code for the project on GitHub. Add the platforms you want to use. I’m only going to install Android, but the code should work on iOS as well. You need to install a few plugins for interacting with the device APIs for working with the camera, file and uploading files. The ngCordova library provides AngularJS wrappers for the plugins installed. These wrappers makes it easier for working with the plugins inside an Ionic app. Breaking down the code above. First you create the controller and import the libraries needed. Inside the controller, set the default data used by the view. This includes the placeholder image to display, an empty description, and the default detection type. LABEL_DETECTION is used since its more generalized than the others. Next, create the method executed when pressing the camera button. Inside the method, declare the options for the camera plugin, setting destinationType to Camera.DestinationType.DATA_URL. This means that once the picture is selected, the callback function will have the data URI of the image. As this data URI is already base64 encoded, it no longer needs converting. sourceType is Camera.PictureSourceType.CAMERA so it uses the image taken from the camera as the source. targetWidth and targetHeight set the preferred dimensions of this image. correctOrientation is true so that it automatically changes the image orientation to portrait and cameraDirection is 0 so it uses the back camera. Finally, encodingType is Camera.EncodingType.JPEG, allowing you to prepend data:image/jpeg;base64, to the data URI so you can display the image. This opens the default camera app on the device by calling $cordovaCamera.getPicture. It uses options as an argument, calling then and supplying the success and error callback functions. The same pattern is true for all plugins that you’ll be using later. Inside the success callback, update the image source (current_image) and reset the description to an empty string. Construct the object using the data URI from the camera plugin and the detection type (me.detection_type) selected by the user. Then convert it to a string so you can use it as content for the JSON file sent to the API. Use the Cordova File plugin to write the file_contents to the file.json file stored in the root directory of the apps sandbox. The third argument for the writeFile method is a boolean value for setting whether to create the file if it doesn’t already exist. When the contents are written to the file, declare the variables needed by the file transfer plugin to work. Below is a headers variable which is the http headers for the request. Since you’re sending a JSON file, you have to set the Content-Type to application/json. The server is the full URL of the API to send the request to and filePath the full path to the JSON file that you’ll be sending. Breaking down the code above. First it creates a new ion-view and specifies the controller to use. Inside the ion-view is the header and the ion-content which are the UI elements that you see below the header. Things like the image, image description, the list of detection types, and the button for taking a picture. Open the js/app.js file that contains the code for initializing Ionic and ngCordova. If you used the Ionic blank starter template, most of the code is already filled out. All that’s needed is to specify the use of ngCordova and edit the contents of the config method to point to the home.html file. Open index.html and link to the ng-cordova.js file after the ionic.bundle.js file. Below the app.js file, link to the HomeController.js file. Don’t forget to specify starter as the value for the ng-app, and inside body, add ion-nav-view so that it will display the home.html view. In this tutorial you built an image recognition app with ionic and the help of the Cloud Vision API. I covered the use of different image detection types such as the label, landmark, logo, and text detection. I didn’t cover Face detection or safe-search detection, but for face detection, you can use something like Fabric.js. This will convert the image into a canvas object and draw circles on the detected faces. For more information on the Cloud Vision API, read the official documentation and I would love to hear your experiences and thoughts.